If you were a child in Alabama, you know Kathryn Tucker Windham. She is a quintessential storyteller who made ghost stories a way of life. It all started in 1966 when a "friendly" ghost named "Jeffery " took up residence in the Windham house. When a group of kids came over and tried to "contact" Jeffery with a Ouija board, they succeeded and Jeffery was photographed. Jeffery became a kind of spirit world collaborator as Mrs. Windham collected stories that became 13 Alabama Ghosts and Jeffrey. My favorite is the Red Lady of Huntingdon College. Kathryn Tucker Windham began collecting ghost stories and other tall tales from around the South. Now 90, she is still in demand as a storyteller. She founded the Alabama Tale Tellin' Festival, held each year in Selma, Alabama. 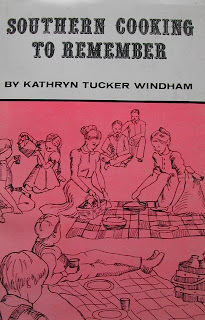 What people may not know is Kathryn Tucker Windham's first book was a cookbook. 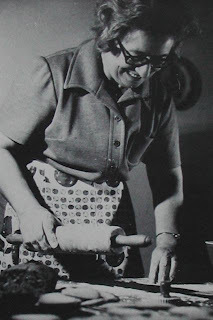 Later she published a second cookbook, Southern Cooking To Remember. In November, I was in a large, well stocked grocery store and found a lovely bag of sunchokes, which I thought was funny since they looked like Jerusalem artichokes to me. Actually, Jerusalem Artichokes are not from Jerusalem nor are they artichokes. They are indeed, sunchokes, tubers from a sunflower like plant. When an early explorer to America sent the tubers back to an Italian friend, he dubbed them, "girasole articicco," quite literally, "sunflower artichoke" or sunchoke. The Italian pronunciation was corrupted and "Jerusalem artichoke" stuck. What do you do with them, my friend asked and Kathryn Tucker Windham knew the answer. Most Southern larders have at least one jar of Jerusalem artichokes pickled in some way. Use a stiff brush to scrub artichokes well. chop coarsely. Chop onions and peppers coarsely. Put chopped vegetables and salt in a large bowl and cover with cold water. put in the refrigerator overnight. being sure to cover it tightly. Next day, pour off the water and place vegetables in a large kettle. Add other ingredients and cook over moderate heat, stirring , until sugar is completely dissolved and mixture boils. Reduce the hear and simmer for half an hour or until relish is thick. Stir right often during the simmering. ladle into sterilized pint or half-pint jars and seal. This makes four pints.